For the first time in 25 years, new construction is coming to the award winning, exclusive, residential, country club community of Boca West. Akoya, named after the Akoya pearl, a traditional symbol of beauty and rare elegance, will consist of 3, 9 story, condominium towers with a total of 120 opulent units. Akoya is being developed by the Siemens Group, who also developed The Polo Club and Gleneagles Country Club, and being designed by renowned Architect, Peter Stromberg with interior design by Steven G. Units will range in size from 2,800 square feet to 4,500 square feet and will feature private elevators that open directly into your unit, oversized terraces some with private dipping pools, floor to ceiling impact glass windows offering panoramic golf course views and state of the art culinary kitchens. Akoya will be a full service, upscale, luxury, building offering 24 hour valet & concierge services. Prices start at $1,100,000. 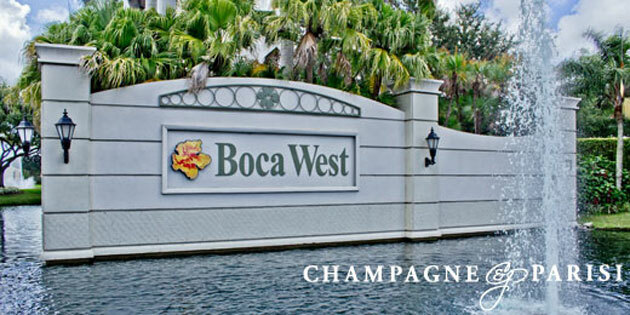 Boca West has been award the #1 Residential Country Club Community by the Platinum Club of America. Among the fabulous amenities at Boca West, you will find 4 championship golf courses, 30 tennis courts, a state of the art fitness center, resort style pool, a serene health spa offering a wide variety of pampering treatments and 6 gourmet dining venues. For additional information about Boca West or to arrange a private tour, please contact Karen Sussman of Champagne & Parisi Real Estate at 561-866-6325.